The Swiftmaps.com GeoPolitical Continent Series Wall Maps have been a top seller for many years with their 2in1 mapping format. Even though the GeoPolitical series may look like a standard continental map from afar a much closer look will unfold an attractive visual layer of 3D shaded physical relief to highlight the mountains and terrain of the continent. Originally created for the educational and school markets, the Swiftmaps Continent Series has been extremely popular in recent years as wall decor in businesses and household with its unique and attractive features. This edition also features a heavy-duty 3mil Lamination that is perfect for many years of durability and dry/wet erase with appropriate markers. Only the best from Swiftmaps line of quality continent wall maps! Laminated: Heavy Duty Paper Stock and Durable 3mil two-sided Lamination for years of use! 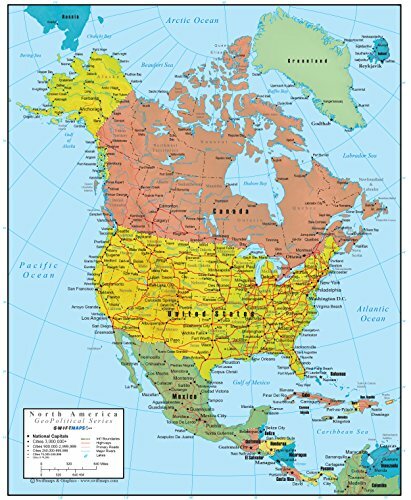 Versatile: The North America Wall Map is perfect for education and business but also extremely attractive for decorative use! Guaranteed: If you are not fully satisfied with your purchase you can return for a full refund - no questions asked! If you have any questions about this product by Swiftmaps, contact us by completing and submitting the form below. If you are looking for a specif part number, please include it with your message.